Longer than any other venomous snake, the king cobra is a uniquely large and deadly foe capable of killing creatures hundreds of times his own size. Because of his size, defensive nature, powerful venom and ability to procreate in large numbers, this reptile is able to live in the wild for decades and propagate its own species all the while. The average life span of a king cobra in the wild is between 17 and 20 years, though that may be longer in captivity, away from the stresses and dangers of the outside world. King cobras are often popular exhibits in zoos, where they are afforded a lifestyle free of the predators that they would face in the wild -- particularly, other snakes, and mammals like the mongoose. A king cobra is able to ward off predators with physical intimidation, using his massive size to his advantage. He can grow up to 18 feet long and is able to lift his body up off the ground in a standing position. Leaving two-thirds of his body flat on the ground for support, he can stand up to 6 feet tall while still slithering along the ground. He also has the ability to spread out the hood around his head, making him look even larger and more intimidating, and strikes fear into would-be attackers with a loud hiss. Should he need to defend himself, the king cobra is equipped with a highly potent venom that can kill opponents significantly larger than himself. One bite from a king cobra can deliver enough venom to kill a full-grown elephant, or a human 30 times over. 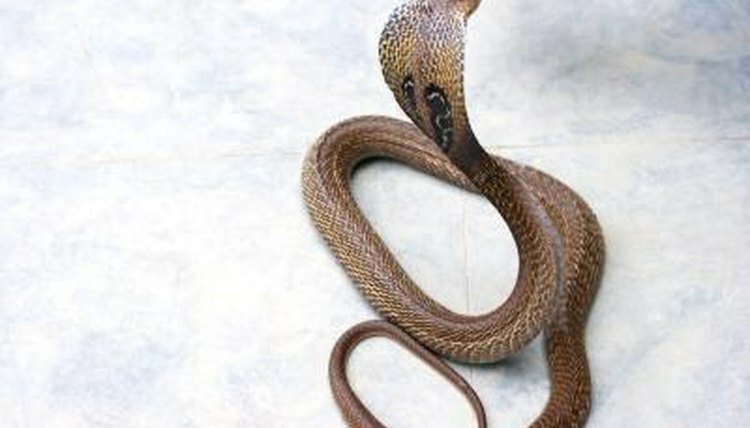 Because of his self-protective nature, however, the king cobra typically avoids such confrontations, choosing to prey on snakes, lizards and smaller animals that pose less of a threat -- these helps account for their long lives. Over the course of a lifetime, a king cobra can give birth to hundreds of babies -- her annual mating ritual can yield as many as 50 eggs every time she is impregnated. Mothers fiercely protect the eggs, but one they are born, the newborns quickly learn to defend themselves -- they are born with venom, abandoned by their mothers just before hatching. This early introduction to self-sufficiency helps prepare king cobras to lifetimes of self-preservation.